Lately, Bowers & Wilkins has been the favourite, with the new Revel system from Harman a close second. 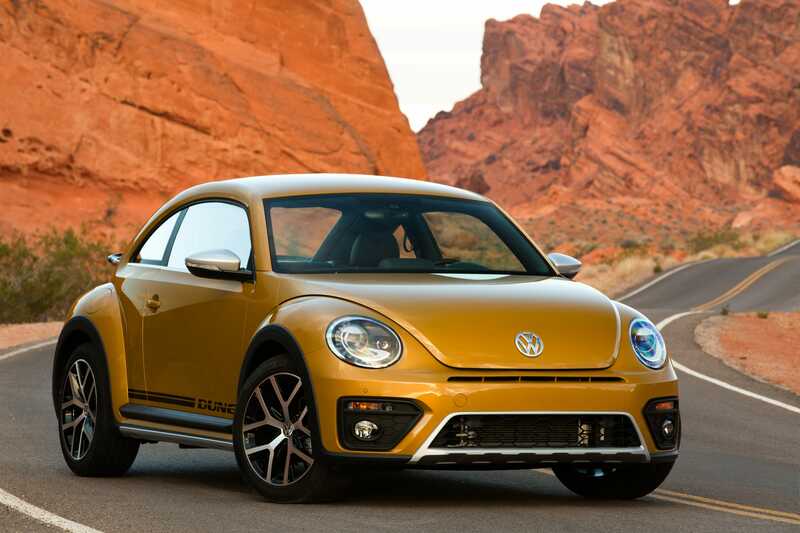 We haven’t sampled any Volkswagens over this period of time, but last week the carmaker let us borrow a special trim of its now famous new Beetle — the 2016 Beetle Dune. The car is meant to evoke a dune buggy from the 1960s or ’70s. We’ll review the car a bit later, but I couldn’t contain my excitement over the audio system, which is one of the best I’ve ever heard, especially for rock ‘n’ roll. 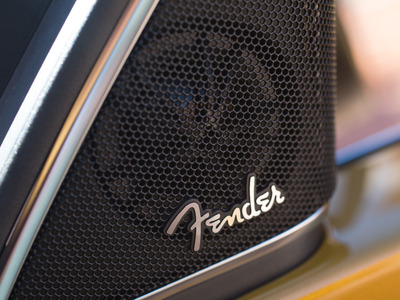 Which makes sense, because the VW system is the result of a collaboration with Fender, the legendary manufacturer of electric guitars — Telecaster, Stratocaster, Jazzman, Jaguar — and amplifiers that are renowned for their ability to deliver crisp tones and sweet, distorted crunch. Matthew DeBord/Business InsiderThey also make these. The nine-speaker, 400-watt VW setup, complete with a juicy subwoofer under the hatchback, is fantastic. 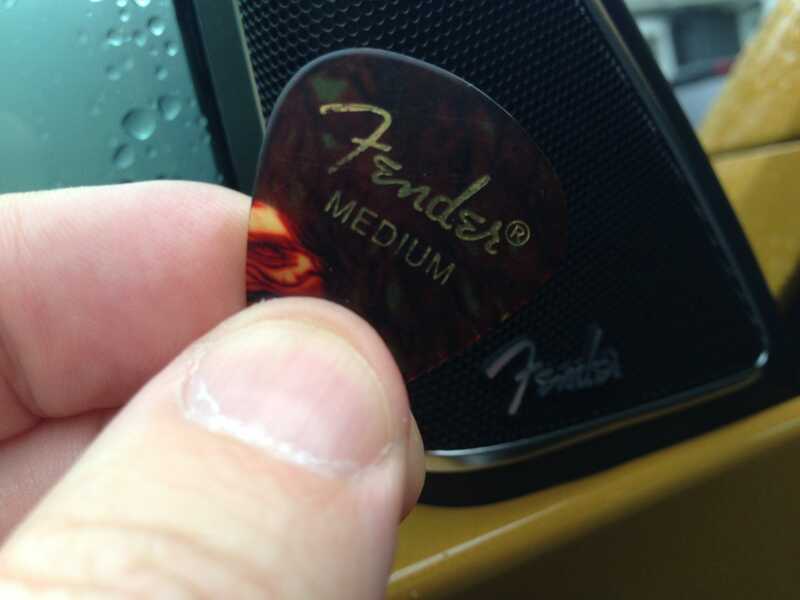 I had heard that one of its best features is that it can be cranked and not produce buzzy or muddy sounds. So crank it I did, with the assistance of my 13-year-old daughter and her Spotfiy account. For me, it was the Led Zeppelin catalogue, particularly Led Zeppelin III, recorded in 1970 and featuring a pretty broad range of music, some mellow, some not. The cool thing about the Fender setup is how energised, detailed, and balanced the sound is — with the volume turned up. It doesn’t have the lush delivery of Bowers & Wilkins, nor does it provide the interrupted excellence — no gaps, no holes, no weaknesses — the Bose is so good at. And it can’t match Revel for concert-hall acoustics. But boy, does it give you some lovely punch! The closest analogy I can come up with is that it’s as if you’re driving around in pair of terrific headphones: the music is just right there. VolkswagenThe eight speakers are distributed throughout the interior. 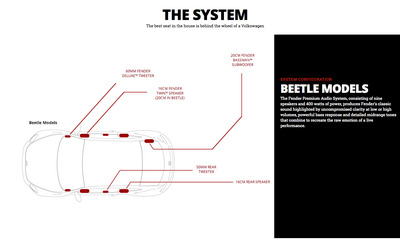 Part of this might be the result of the $27,000 Beetle’s cosy environs — not too big, not too small — which are awfully well isolated from outside noise (additionally, the engine, a 1.8-litre turbo, doesn’t generate too much racket). And part of it might have been the music. Led Zeppelin — whether you love, hate, or couldn’t care less about the band’s albums — produced interesting recordings that played around with stereo, choreographing sounds across both channels while often keeping a thunderous guitar-bass-drum vibe underneath it all. Kind of the perfect stuff for speakers with detailed highs and midranges, supported by a subwoofer. Matthew DeBord/Business InsiderThe Bassman subwoofer is in the trunk. So that’s fun, but so is the more direct attack of a more contemporary rock act. My daughter and I were tooling around and thinking, “Heck, with a system this good, plus phones loaded up wth songs, plus Apple CarPlay and Spotify, not to mention satellite radio and even good old-fashioned FM radio, we could jam along for hours. A spontaneous road trip nearly ensued. “Immigrant Song” and “Since I’ve Been Loving You” never sounded as fantastic, and I can recall listening to those tunes on vinyl through audiophile gear about 1,000 years ago (the gear wasn’t mine). “Come As You Are” was no slouch, either. Both Volkswagen — which is enduring a very rough patch right now with its massive emission-cheating scandal — and Fender should be commended for this system. 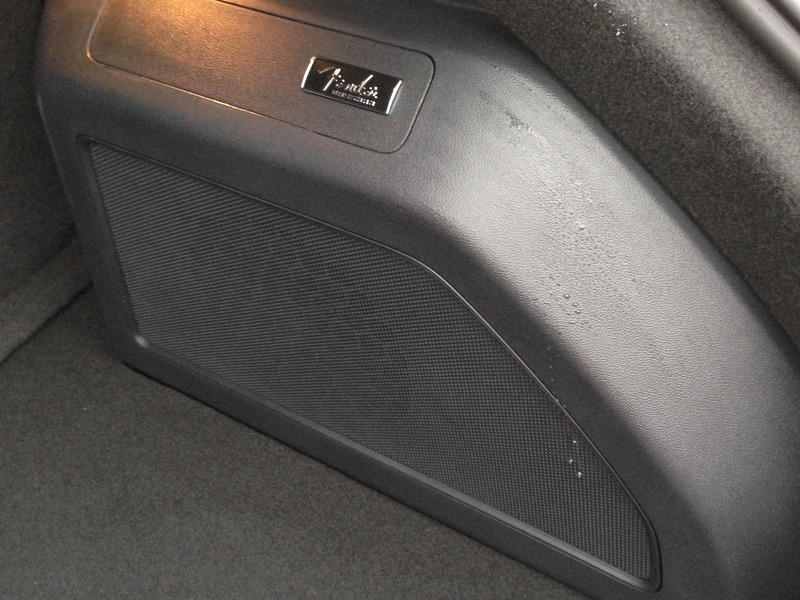 And bringing something a little bit different to the car-audio world.